Sports bars: Boasting the best comfort food, the coldest beer in town, and endless memories. Cheering on your favorite teams among like-minded fans, whether professional or college (Roll Tide or go Tigers! ), makes the game even more enjoyable. Now put on your jersey and pull up a barstool at these 10 best sports bars in the state. 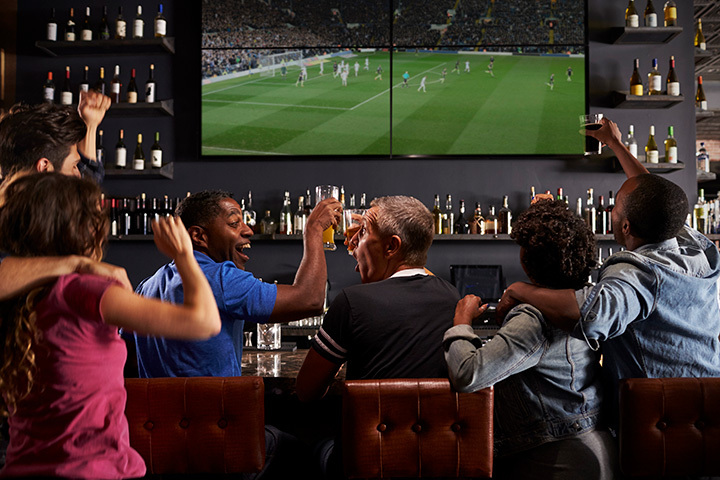 Part pub, part sports bar, you can catch some of the best televised sports action right here. Featuring Birmingham’s most extensive collection of craft beer, you’re sure to find your favorite brew—and maybe even discover a few new ones. Make sure you pair your frosty cold drink with some of the city’s best hot wings! Just a stone’s throw from the University of Alabama, the Houndstooth is a sports fan tradition in these parts. Guests rave about the nachos here, along with a culture and atmosphere of true Alabama fandom that simply can’t be duplicated anywhere else. This bar has also gotten plenty of accolades from Sports Illustrated, and it’s well deserved. This bar may have gotten its start in Nashville, Tennessee, but it’s earned quite a following in Alabama. Having garnered attention from several publications, Sam’s Sports Grill is known for its handmade pizzas, burgers, barbecue, and plenty of sports games on every television. Everybody needs a hero every now and then, and Heroes Sports Bar & Grill is the rescue every sports fan deserves. With two locations in the Mobile area, guests have double the chance to grab some of their favorite food and drink offerings, like their perfect hot wings or slightly spicy fried pickles. Equal parts sports bar and live music house, there’s always something exciting happening at Ford’s. Take your pick of the indoor or patio bar while you listen to live music on the weekends or watch your favorite sports team on their way to victory. And their rainbow margarita is not to be missed! Equal parts delicious food and sports fun, Augusta’s Sports Grill knows how to treat you like family. Their fans marvel at the high-quality food (especially the fried green tomatoes! ), as well as its consistency and friendliness. There are large TV screens everywhere you turn featuring every game imaginable. Touted as the best place in Auburn to watch the big game, locals and travelers alike agree that a trip to Halftime on game day is a must. With over 30 draft beers and a full food menu, guests can fill their stomachs while fueling their appetites for all things sports. Locals agree that Diamonds is one of the best places to go for sports games and live music. With 11 pool tables and plenty of TV screens, visitors have plenty to keep them entertained. While you’re there, take advantage of their full kitchen complete with hot wings, oysters, and other fan favorites. This simple, no-frills sports bar sticks with what they do best—serve cold beer, good food, and a heaping helping of sports. Here you’ll find a good variety of live music, as well as pool, darts, and the occasional corn hole tournament. This sports bar is a prime locale for sports fans karaoke lovers alike. If your favorite team isn’t playing, grab the mic and be the star of your own concert. The food alone is plenty of reason to hang out for awhile.